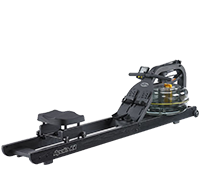 The Reebok rowing machine Z-Jet 400 is a beginner machine with good ergonomics and it is exclusively available at Sport-Tiedje. Offering 28 training programmes, of it one heart rate programme and a race programme, you have a big selection, which offers the appropriate programme for every training target. Get your body in shape - with a Reebok rowing machine. Rowing is an excellent whole body workout. Besides strengthening muscles, you can do cardio workouts on the Reebok rowing machine and improve your stamina. The Reebok rowing machine is also excellent for fat burning. 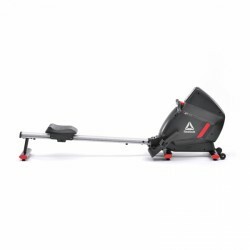 A Reebok rowing machine is ideal for users of every age and can be used from beginners to trained leisure sportsmen. The rowing movement is joint-gentle and trains coordination. Another advantage of the Reebok rowing machine is home use. You can comfortably exercise at home - no matter at which time and independent of the weather. Do you have questions about a Reebok rowing machine or other rowers? Please contact our customer service! We are available by phone, email or personnally at one of our stores all over Europe! We hope you enjoy rowing!